Aggregate replacements from used tyre chip or tyre shred - Intowaste provides BSI PAS 107 technical sales and supplies tyre chip to the landfill and civil engineering market - as a replacement for virgin aggregate for drainage and for unbound civil engineering applications. 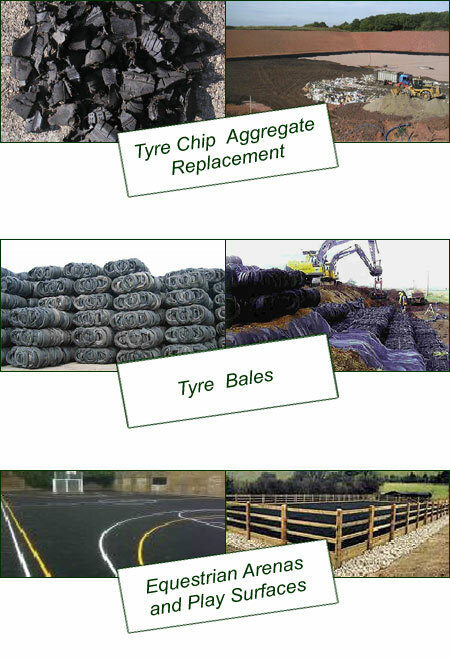 Intowaste provides the landfill engineering & construction industry with BSI PAS 108 Tyre Bales (Blocks). We also provide technical sales to potential users. Wire free tyre chip for equestrian arenas, all weather gallops. Tyre crumb rubber for sports and play applications, safety surfaces etc. Tyre rubber wet pour surfacing for equestrian stable yards, parade grounds, golf course paths etc.